Home all alone tonight…Can’t sleep, nothing on tv, don’t feel like studying or reading…feel like eating something sweet…too lazy to cook, absolutely nothing sweet at home…. They are one of my favourite desserts, the best i have ever eat was during a trip in Stockholm at “muffin bakery”…I’m still dreaming about it! 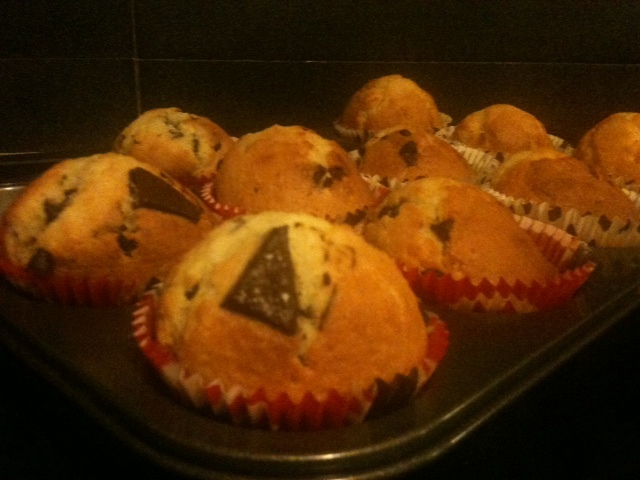 Every time I make muffin at home I use Nigella Lawson recipe…I can assure you they are amazing….and so easy to do! The only thing I do differently is changing the main flavor for exemple instead of cocoa and chocolate chips I put granted carrots and icing cinnamon or bluebarry or chocolate and orange….you can choose whenever taste you like the most! Every since I learned this recipe I can’t stop making muffins!! so THANK YOU NIGELLA!! I can’t wait to eat one! !